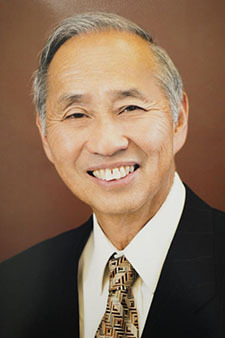 THS Class of ’61 graduate Jerry Gin has been instrumental in developing healthcare advancements that have improved the lives of millions of people. Born in Tucson to Chinese immigrants, Jerry excelled in AP classes in chemistry and calculus as well as played varsity tennis (ranking #3 in national interscholastic doubles and #1 in the Southwest) while attending THS. He went on to obtain a BS in Chemistry, UofA; a PhD in Biochemistry, UC Berkeley; and an MBA, Loyola College. He fulfilled his military obligation as a captain the Public Health Service by doing post-doctoral research for NIH. At BioScience Labs (now Quest Diagnostics), he established and directed clinical labs throughout the US, helping it to become the world’s largest clinical laboratory. As a corporate director at Dow Pharmaceuticals (now Sanofi), he traveled worldwide, developing strategies to address global pharmaceutical needs. He then joined Syntex (now Roche) as Director of Strategic Planning. To make even greater improvements in healthcare, Jerry became an entrepreneur. He first informed Visionex, which created the Schirmer Color Bar Test for dry eyes. Next, he established ChemTrak, which developed an easy, affordable home cholesterol test available in drug stores. To treat diseases of the inside of the eye, he created Oculex Pharmaceuticals, which developed a biodegradable drug delivery system; its first product targeted macular edema, a major cause of blindness for diabetics. He next formed Nuvora that devised sustained delivery products to treat disease of the mouth. Recognizing that inflammation, oxidative damage, and biofilms are the causes of most diseases, Jerry established Livionex and created an affordable, safe technology to correct these problems. This company’s products have been able to treat diabetic leg edema, early cataracts, wounds, burns, and arthritis. Its first product, Livionex Dental Gel, removes plaque and treats gingivitis and periodontitis much better than standard toothpastes. His next adventure is in the science of consciousness, where he serves as Chairman of the Foundation for Mind-Being Research, a non-profit organization that explores the nature and science of the mind. Jerry and his wife, Peggy, have two sons and three grandchildren.